Recent incidents involving autonomous vehicle crashes, have made industry participants assume a lower profile. While these setbacks may slow progress in the sector, it does not mean the companies involved are taking their foot off the gas pedal in developing technology to move autonomous vehicles forward. Any advanced technology industry will encounter growing pains, and as I said in my latest report, this space is just getting interesting. Allied Market Research puts the global autonomous vehicle market at $54 billion this year and $556 billion in 2026, growing at 40% per year. Even if these numbers are off by 25%, we’re still looking at a rapidly growing market. And while the regulatory issues are real, there is growing economic pressure to solve the regulatory puzzle. Over 68% of freight travels on U.S. roads for an extended period of time. And with the trucking industry unable to fill driver positions, even with increasing pay and benefits, the American Trucking Association reports delays and costs are rising. This lack of drivers, combined with an explosion in delivery of everything conceivable that consumers may purchase, as we recently looked at in our piece on the sharing economy, is placing growing pressure on regulators to formulate solutions to the autonomous vehicle problem. Trusting these issues will be resolved, let’s take a look at a few companies that are forging ahead in the autonomous vehicle space. Netherlands based NXP Semiconductors is the world’s largest supplier of automotive semiconductors, and will have a major role to play as cars and trucks move to autonomy. One of the things I like about NXP is the fact that it is already deeply embedded in the auto industry. This gives the company insight into customer needs as autonomous vehicles move through the Levels of Autonomy I detailed in my previous article. NXP is aggressively expanding its relevance in autonomous vehicles, both through internal development of products as well as through acquisitions. Late last year the company acquired OmniPHY, a pioneer in high-speed automotive Ethernet IP. Through the acquisition, NXP is ensuring it can maintain the speed and number of connections necessary as vehicles become increasingly autonomous. By purchasing OmniPHY, NXP is enhancing its capability to capture the entire value chain in the connected automobile. Controlling connectivity points is a major strategic competitive advantage, and allows NXP to work not only with automakers, but with other equipment and sensor companies, cementing NXP as a vital player in the autonomous vehicle ecosystem. From a valuation perspective, NXP trades at a 13 PE ratio, and pays just over a 1% dividend. The company has grown earnings per share an average of 62% over the past 5 years, and currently has profit margins of over 28%. 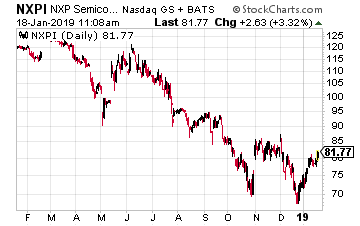 NXP shares have never fully recovered from a failed merger attempt with Qualcomm (Nasdaq: QCOM) in 2018 after a prolonged, almost 2 year courtship. The deal fell through and many NXP stock owners, who had been in the stock only for the merger, abandoned ship. The stock appears to have bottomed around $70, and now trades close to $80, well off the pre-merger prices in the $120s. 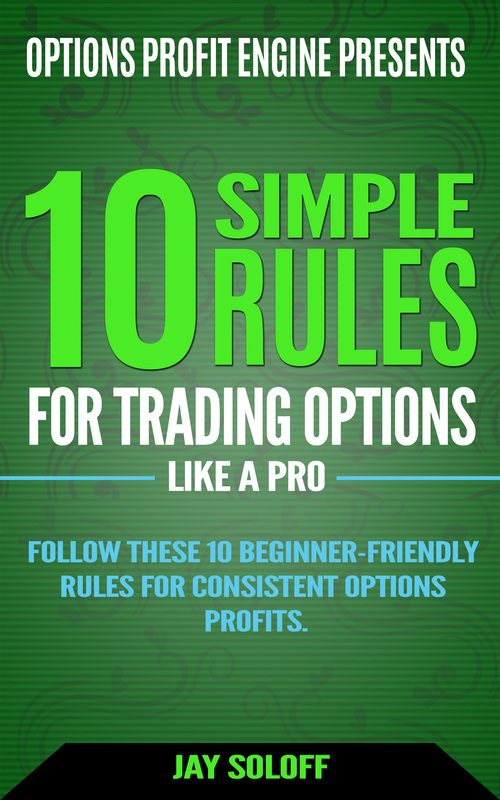 A combination of value and strategic market positioning makes NXP a buy at these levels. The company has ensured its relevance in the autonomous vehicle market and should reap the benefits as this market matures. Magna International is a Canadian company that wants to ensure the autonomous vehicle is not only safe and secure, but retains the style and design each automotive manufacturer has heavily invested in. As Magna explains, it does not want the autonomous car to look like a science experiment with vehicle sensors, such as LIDAR, mounted obtrusively all over the car. Using what it terms MAX4, Magna has developed a self-driving system that can enable up to Level 4 autonomous capabilities, while at the same time disguising the fact that the automobile is anything different than what the manufacturer has on the showroom floor today. The MAX4 system can be mounted on an automobile, such as a Jeep Grand Cherokee, with the LiDAR, radar, and ultrasonic sensors all contained within the bumpers and other currently existing cavities of the car. While I’m not a huge fan of the company, the Tesla (Nasdaq: TSLA) business model does demonstrate consumers want not only the latest technology, they want functionality wrapped in design. And they will pay premium prices for this combination. Magna ensures that each automaker can retain and enhance vehicle look and design, without concern that the sensor requirements of the autonomous vehicle impinge on their branded look. And, Magna is not only offering the ability to retain design, the company is also forward thinking in addressing the changing needs, and look and feel, of the interior of future autonomous vehicles. The company recently released its flexible seat configuration design for autonomous vehicles. The seating system allows for three variations in seating patterns that are fully automatic, with seats moving electrically along tracks mounted in the vehicle floor. Consumers have the option of a “campfire” seating arrangement with all seats facing the middle of the vehicle, a “cargo” configuration where seats move to the front of the car to provide a large cargo area in back, and a seating configuration with electronically insulated sound barriers which allows for private phone conversations in a ride sharing environment. Magna is closer to the ride share business than other companies, with a $200 million private investment in sharing economy company Lyft (Nasdaq: LYFT, pre-IPO). 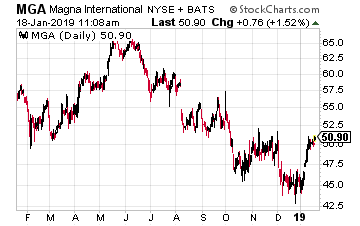 Magna currently trades with a PE of 7 and pays just over 2.5% in dividends each year. The company has averaged 14% earnings growth over the past 5 years, and is projected to grow earnings 13% this year. As with NXP, a pullback in the stock in 2018 is providing an excellent entry price at these levels. Magna’s innovative designs and technology should provide earnings expansion as the company outfits the car of the future. 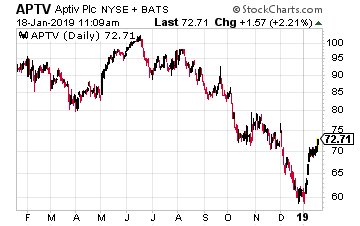 Finally, I would like to revisit a portfolio holding of the Growth Stock Advisor service, Aptiv. Aptiv is an Ireland based company that was spun out of Delphi Technologies (NYSE: DLPH), formerly Delphi Automotive, in late 2017. Delphi Technologies is now the “powertrain” part of the business providing propulsion, combustion and electronic solutions. This is the old industrial commodity side of the business, and the stock has performed abysmally since the spinoff of Aptiv. Aptiv is, as former Delphi Automotive, and now Aptiv CEO Kevin Clark stated, focused on “active safety, autonomous driving, enhanced user experiences, and connectivity”. Aptiv provides the sensors, connectivity, and most importantly deep industry and product expertise, which is so important to establishing credibility and trust from automotive manufacturers moving into the autonomous vehicle space. As I detailed in my latest report on autonomous vehicles, there are hurdles to full autonomy, one of which is working out the legal liability issues that arise from a fully autonomous vehicle. But, Aptiv is making the incremental improvements that ensure the autonomous vehicle will be ready when the regulatory issues are resolved. After getting the lowdown at CES on the Aptiv fleet of Lyft cars that is ferrying passengers around Las Vegas, Extreme Tech put the Aptiv advancements over last year this way, “For example, implementing RTK (Real-Time Kinematic GPS augmentation) has allowed the cars to locate themselves within 2.5 cm (instead of 10 cm). That makes the difference between not knowing and knowing whether a pedestrian is standing on the edge of the curb or in the crosswalk.” Advancements like these are crucial to the developing regulatory framework, and to putting fleets of autonomous vehicles on every road, not just in test environments like that taking place in Las Vegas. Aptiv is continually advancing technology, and with deep roots in the automotive industry, it is one of the purest autonomous vehicle plays available to investors. The company has a forward PE of 13, and is expected to grow earnings this year 31%. Each of these companies offers a great way to play advancements in the autonomous vehicle industry as it matures in the coming years. Whether through the brains and connectivity of NXP, the technology and design of Magna, or the autonomous integration provided by Aptiv, it’s hard to go wrong with these top players in the space.